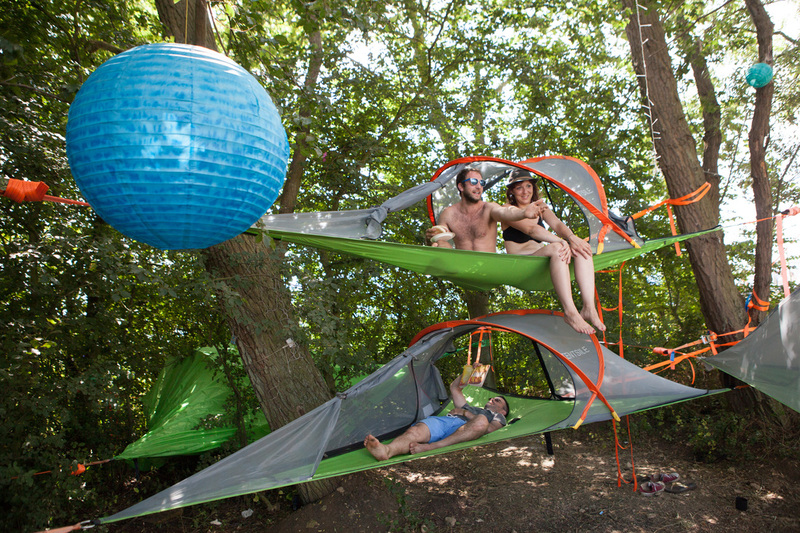 What do you sleep on in camping out? 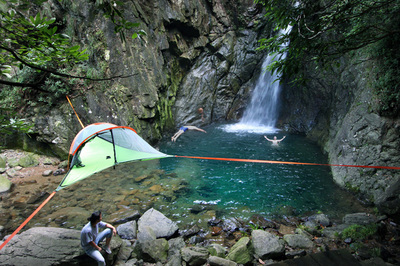 hammock or tent? now you can enjoy both with Tentsile Tree Tent! 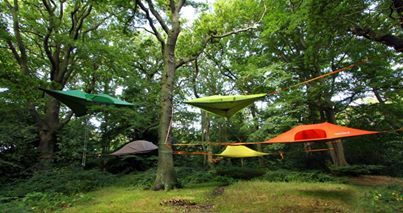 TENTSILE founded by a UK Treehouse architect Alex Shirley-Smith with the vision of allow people to experience the magic of hanging out in trees. a tent allow you to hang on trees like hammock, still offering spacious outdoor living,bug and weatherproof shelter like tent you used to have. Now you can have less worry about wild visitors drop by your tent, heavy rain pour flush the camp ground,night crawlers underneath tent. all you have to worry is not too overload it and find the good trees anchor. The down side is the weight of 6.5kg for the 2P Connect Tree Tent with tightening gear, easily 3times the weight of normal 2P tent. if you're rope tensioning expert you know what to do to replace the heavy rachets. in my mind now, use primitive pulley system that could easily save pounds. but spend more energy in setting up. looking forward to see the lightweight product in the future. The Tentsile Connect is here! 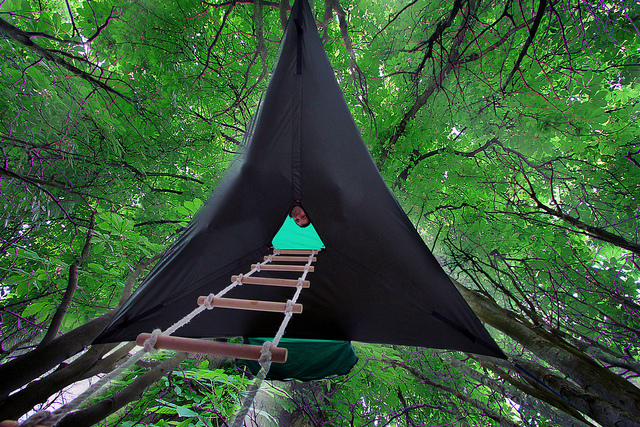 This ultimate 2 person portable treehouse tent has a removable fly sheet, available in a choice of colours. It offer you and your partner the chance to connect with each other and nature, but can also connect to other Tentsile Connect tents to create suspended super-camps of 3 or more tents creating additional central communal space! Lighter, cheaper, modular, versatile and truly the best in arboreal camping. Now you and your friends can all hang out together with no limit to the size of your crew. 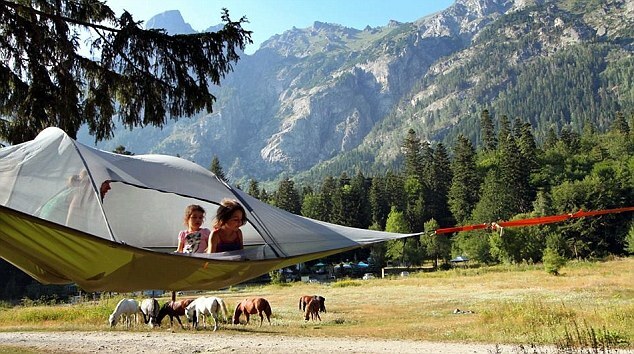 The Tentsile Stingray is a 3 person tree tent offering users a uniquely communal and comfortable outdoor experience. 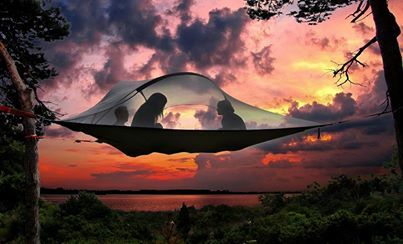 Stingray now come as standard with a removable SUPER fly sheet (available in a range of colours), full insect mesh roof for maximum ventilation and unbeatable views, there is no better way to hang out in nature. The Stingray comprises a spacious triple hammock interior, accessed via a floor hatch in the centre or via the large front door. It can be suspended above the ground or pitched on the ground in dry conditions.